I’ve got a sample workout for you today from my new Kettlebell Boot Camp Workout program. Enjoy! TWO different pairs of exercises to start – push ups (15) and KB swings (20) … burpees (7) and bicep curls with a heavy resistance band (20). Complete pair one (push ups and KB swings) of exercises back-to-back, without rest, ONE time. 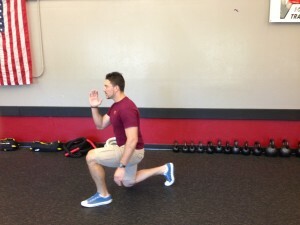 Do walking lunges for about 25 yards. When you arrive at your destination, complete exercise pair two (burpees and band curls). Lunge back to where you started. Repeat for TWO rounds of each exercise pair, FOUR sets total of lunges. close grip push ups (12) and KB goblet squats (10), bear crawl between stations, pull ups/inverted rows (4-10, depending on fitness level) and squat jumps (12). Whew! ￼ That’s a fun – AND tough – one for you to try this week.